I have never been a big meat eater and am a big proponent of sustainable food, so much of what I cook is vegetarian by default. This became even more true when I went to college, as my best friend-turned-roommate-and-cooking-partner-in-crime turned out to be a vegetarian, meaning that we only cook vegetarian dishes during the school year. It wasn’t until last year, however, when a few of my friends decided to make the transition from vegetarian to vegan that I had any experience with this dietary restriction. My best friend and I are the resident chefs/bakers of our group, which was fine and dandy until the birthday of one of our vegan friends. Then life got interesting. We all know cake is necessary on your birthday. But what do you make for someone who doesn’t eat any dairy products? Vegan baking tends to get a bad rap from people who think that baked goods without eggs, butter or milk couldn’t possibly taste good. It turns out that this is most definitely an unfair statement. 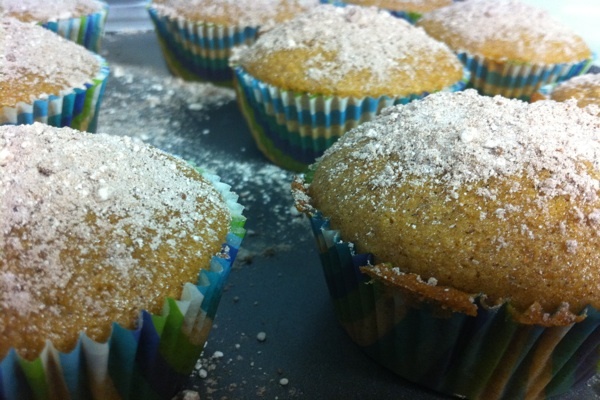 The vegan cupcakes we made were perfectly light and fluffy, better than any non-vegan baked good I’ve ever made! I’ve made vegan treats on various occasions since then (for vegans, and, sneakily, for non-vegans), and they are delicious every time. This recipe for chai latte cupcakes is a new favorite; baked for friends, special occasions, or just for yourself, this vegan treat is bound to be a hit with both vegans and non-vegans alike! Heat the soy milk in a small saucepan over medium heat until almost boiling. Add the tea bags; cover and remove from heat and let sit for 10 minutes. Once the tea has steeped, dunk the tea bags a few times in the soy milk and squeeze gently to extract any excess tea before removing the bags. Measure the soy milk and tea mixture to make sure it measures 1 cup; if not, add some more soy milk until it is. In a large bowl, whisk together the oil, yogurt, sugar, vanilla and tea mixture until all yogurt lumps disappear. Sift the flour, baking powder, baking soda, salt, cinnamon, cardamom, ginger, cloves, and pepper into the wet ingredients. Mix until large lumps disappear, although some small lumps are ok. Completely fill the cupcake tins and bake for about 20-22 minutes, or until a toothpick inserted into the middle comes out clean. Mix all the ingredients for the topping in a small bowl. 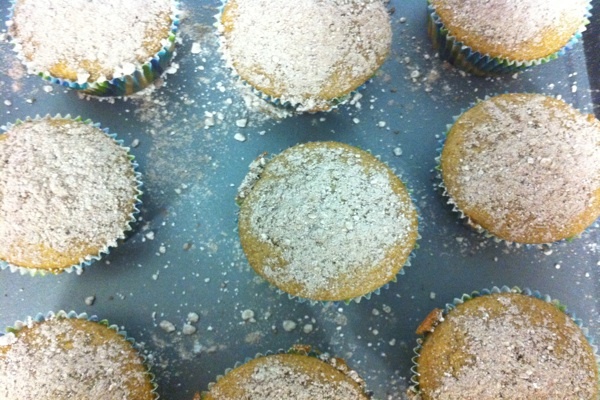 Make sure the cupcakes are completely cooled before sprinkling with the topping. « prev | Avocados: They’re Not Just for Guacamole! Yum! I love chai tea and vegan cupcakes! I’m not a vegan myself, but I have also discovered that vegan cupcakes have a much better texture than non-vegan cupcakes.